When people think of the Caribbean, warm weather, beaches and water sports are the first things that come to mind. However, the Caribbean also has history and culture as well. In this regard, I have noticed an increasing number of shore excursion offerings involving visits to the great houses of the Caribbean. Perhaps this is due at least in part to the popularity of the television series Downton Abby, which is set in one of the great country houses of Britain. The Caribbean great houses were inspired by those in Britain and continental Europe. In the days of the British Empire, those who set off from Britain to make their fortunes often aspired to imitate the aristocratic estates back home. Thus, prosperous Caribbean planters frequently built mansions in the midst of their plantations. The Caribbean great houses were not on the same scale as those in Britain. However, they too were of architectural interest and contained luxurious furnishings. Of course, the Caribbean great houses differed from the British in another respect. In Britain, the servants and the farm workers who supported the estates generally were paid whereas in the Caribbean, the servants and the plantation workers were enslaved people. Consequently, after 1834 when slavery was abolished throughout the British Empire, the plantation system collapsed. As a result, many of the Caribbean great houses were allowed to fall into ruin. However, a number of great houses remain and are open to public view. Visiting them is enjoyable not only from a historical and sociological perspective but because they are attractive buildings usually in an eye-pleasing and relaxing setting. Also, quite often they offer a glass of rum punch at the end of the tour. Here are a few examples. One of the best examples of a Caribbean great house is Sunbury Plantation in Barbados, that most British of the Caribbean islands. The plantation was founded in 1660 by Matthew Chapman, a relative of the Earl of Carlisle. However, for most of its existence, it was in the hands of the Barrow family who named it after their home in Kent in southern England. When they left in 1835, the plantation was 413 acres and had 223 former slaves living on it. A number of owners followed. In 1981, Mr. and Mrs. Keith Melville purchased the house and its immediate grounds and began to restore it. The house sits in a pleasant, shaded oasis amidst a sea of sugar cane fields. Its architecture reflects its environment with walls two and a half feet thick to withstand hurricanes. Nonetheless, the rooms on the ground floor are quite large and airy. Upstairs, the bedrooms are relatively much smaller. A fire in 1995 destroyed the house's original furniture. However, the owners have secured replacements and the house now contains an impressive collection of antiques. Perhaps the most impressive piece is the huge polished table that dominates the dining room. The upstairs rooms contain 19th century furnishings and clothing while the basement has a collection of antique carriages. Sunbury is also a restaurant and there are tables and chairs in a pavilion behind the house. Some shore excursions to the plantation feature an English-style afternoon tea. The tour that I was on featured a rum tasting. 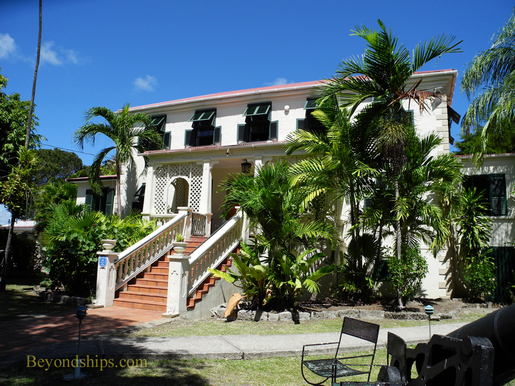 Sunbury was a sugar plantation and one of the products that is made from sugar cane is rum. The tasting was held on the grounds next to the house in the shade of a tree that must be centuries old. It featured several varieties of rum and the lively instructors provided recipes for rum punch and rum drinks.